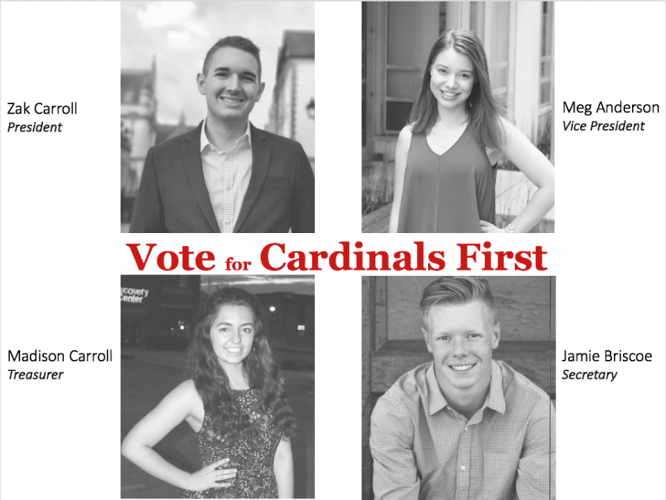 On Friday, April 13, the results of the 2018 William Jewell College Student Senate cabinet elections were announced. The cabinet titled “Your Voice, Your Choice” was elected, winning a majority of 167 votes in the first round and 208 in the second round. For the 2018-2019 academic year, Jakob Miller, junior mathematics and economics major, will be the president of Student Senate; Sarah Lewis, sophomore business and political science major, will be vice president; Hannah Keeney, sophomore psychological science and Applied Critical Thought and Inquiry (ACT-In) major, will be treasurer; and Alex Thiessen, first-year political science major, will be secretary. This cabinet ran on a platform of communication and inclusion. “The ultimate goal that our campaign is to communicate to the voters that we want to strengthen the community through better communication, collaboration and promotion,” said Miller. The cabinet also made several promises to students throughout the campaign period. Of note were the promises to include more students in discussions regarding issues on campus and improving the communication between the administration and the student body. “[We will be] including more students from different backgrounds and organizations in discussions over campus related issues: title IX, diversity and inclusion, campus safety, event planning, Jewell sports, etc. This is the hallmark of our campaign because we believe Student Senate cannot discuss these varying issues alone nor can we act alone in solving them,” said Miller. During the campaign week, this cabinet used Twitter, Facebook and fliers on campus; distributed plastic Easter eggs around the quad with candy and their campaign slogan inside; designed and handed out cookies to students; and wrote their names in chalk on walkways around campus. Two other cabinets campaigned this year. 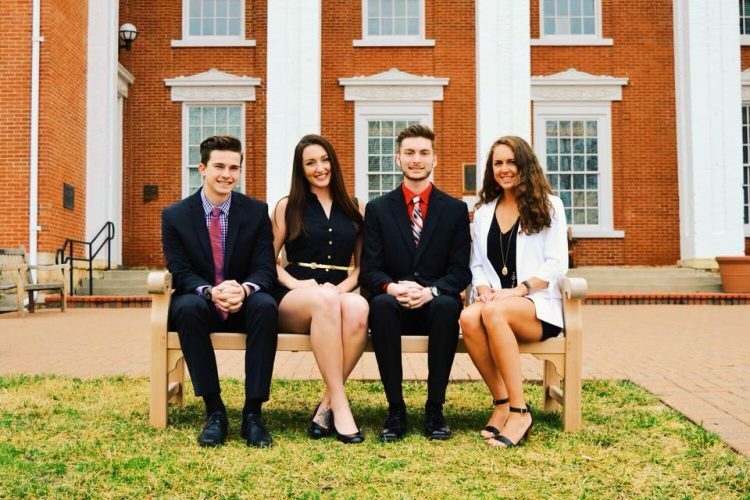 The “Hand in Hand” cabinet was comprised of Alex Blevins, junior accounting and Spanish major, Kelsey Jepson, junior nursing and ACT-In major, Kitt Wilhelm, sophomore English and ACT-In major, and Sam Schneck, first-year political science and economics major. This cabinet’s goal was to promote and advocate for campus groups to create a more inclusive and representative campus community and to contribute positively to the College’s goal of improving retention, particularly for first-year students. This cabinet placed second in the election with 144 votes in the first round and 205 votes in the second round. The third cabinet in this year’s election was called “Cardinals First.” This cabinet was comprised of former Student Senate President Zak Carroll, junior Oxbridge Institutions and Policy and international relations major; Meg Anderson, junior Oxbridge History of Ideas and physics major; Madison Carroll, first-year Oxbridge Institutions and Policy and philosophy major; and Jamie Briscoe, first-year biology major. This cabinet focused their campaign around enacting change in three areas: title IX, institutional health and off-campus housing and ways to improve student welfare. Two members of this cabinet, Anderson and Zak Carroll, are studying abroad this year and were absent during the campaign week. Though all members were able to participate in the campaign debate, the cabinet did not comment on how distance affected their campaign overall. “Throughout this cabinet race, I’ve been struck by the fact that Jewell’s vitality is the outcome that matters most. I feel strongly invested in the school […] the cabinet race will be a success as long as the elected cabinet can help Jewell thrive,” said Anderson. This cabinet placed third in the election. Current Student Senate President Drew Novak, senior political science major, extended his congratulations to the new, elected cabinet and to the other cabinets on a hard-fought campaign. He admitted that this year’s election process was more eventful than anticipated. “While there were issues with the election process, the Cabinet was pleased to have been able to host the fair and democratic election that the student body deserves. We look forward to working with Jakob, Sarah, Hannah and Alex in the upcoming transition process and wish them the best of luck in their future endeavors as cabinet,” said Novak. Novak is alluding to several unexpected events throughout the campaign period that caused confusion and delays in voting. This includes drama at the annual Cabinet Debate, held April 6 and hosted by former Hilltop Monitor Editor-in-Chief Kristen Agar, senior accounting major. The debate is held every year to provide cabinets the opportunity to voice their stances on topics relevant to the campus community and to provide other students with a platform to ask questions. This year’s debate sparked controversy as Miller was named by an audience member to be the author of “Jewell Fake News” and Zak Carroll quoted figures regarding the College’s financial status from a Higher Learning Commission (HLC) report published in November 2017. While the revelation about Miller sparked discussion localized amongst students, Zak Carroll’s comments led to an intervention from the College’s administration and resulted in the live-stream video of the debate being removed from social media. This year’s election proceedings did not go according to plan and it was only the third survey sent to the student body that was used to record votes. The original two surveys were discarded as some students were unable to access the first and the second was accessible to people outside of the College community. To ensure accuracy and fairness in this election, the current Student Senate Cabinet opted to use the online service “Election Runner,” which creates personalized links for each person allowed to vote. These links were digitally distributed to the entire student body, giving each student the opportunity to vote once. Despite the supposed guarantee granted by outsourcing the election process, six students were not delivered their voting links on time. These students’ links were later emailed to them personally and they were allowed to vote. While these issues were ultimately circumnavigated, they resulted in a shorter voting period and the Cabinet election results being announced four days behind schedule. Chris McCullick, assistant business professor and Student Senate advisor, commented on the amount of work that it takes to run the Student Senate and remarked on the credibility of each cabinet that campaigned. “As Student Senate advisor this year, I’ve seen first-hand how much passion the student representatives have for Jewell. The amount of work that goes into running Student Senate is tremendous. And, I’m so grateful to have had the opportunity to work with the Cabinet this year. […] I thought each of the representatives did an excellent job during the debate and would serve the student body well,” said McCullick. Photo courtesy of Sydney Georges.